The site in Rwanda's capital city Kigali where ten Belgian UN peacekeepers were murdered by the Hutu extremists in order to provoke a withdrawal of the UN forces, which then cleared the way for the full scale of the Rwandan genocide to unfold. More background info: When the UN mission for Rwanda (UNAMIR) was set up in 1993, the only first-world nation willing to provide professionally equipped soldiers for the peacekeeping effort was Belgium, of all countries. This was unfortunate in so far as Belgium was also the former colonial power in Rwanda, until independence was granted in 1962. Normally the UN avoids having personnel from former colonial countries involved in the relevant countries, in this case there wasn't much choice, given the reluctance of all other developed nations to take part. The rest of the mission personnel was eventually comprised of Ghanaians, Tunisians, Bangladeshis and other nationals from developing countries. Obviously, Belgian soldiers present in Rwanda posed a certain risk for the overall atmosphere, and also for the Belgian troops themselves, since they could potentially be targets of aggression. But what happened on the first day after the genocide broke out, on 7 April 1994, was, however, not so much rampaging mob aggression, but rather a very carefully calculated assassination for a very specific purpose. The plan did indeed work. Shortly after the calculated murder of the ten Belgian soldiers, the rest of their troops were in fact pulled out – while at the same time all the Western nations evacuated their expatriate residents from Rwanda, together with a sizeable proportion of the UN mission staff too. In short: the "international community" decided to leave Rwanda to it, i.e. abandon it to the genocidaires who now had virtually free rein. Ten Belgian soldiers' lives lost was all it took to make the world run with its tail between its legs and then stand by while nearly a million Rwandans were systematically slaughtered. Despite that huge difference in numbers it is of course never really morally right to weigh a certain number of dead up against another (or is it? – it's one of the persistent dilemmas in a context such as this and I have no sure answer). The tragedy of the deaths of those ten Belgian soldiers should certainly not be belittled here. Their deaths were indeed brutal and despicable too. Apparently they were first taunted, intimidated and beaten, before being executed. Some were killed right away, the rest made a stand and held out in a three-hour siege in one of the buildings at the Rwandan army barracks they had been taken to, but were finally overpowered and killed by grenades and machine-gun fire. The mutilated bodies of the Belgian paratroopers were then dumped in a pile at the morgue of a nearby hospital – a further shock for the UN staff and their commander when they finally reached their men. It remains a bone of contention whether these casualties could have been avoided – but UN commander Dallaire holds that since the killings took place within the Rwandan army barracks, he wouldn't have had the military means to take on the army by force at their base – and had he done so, the UN would have become a combatant party in the conflict and thus a legitimate target for more and wider-ranging attacks. Far more casualties could have been the result – and it would have meant the definite end of the peacekeeping mission. Whatever the military and/or diplomatic arguments, what became clear was, that the Hutu extremists' plot to sabotage international support for the UN mission had worked like a treat. The memorial site, set up by the Belgians on 7 April 2000, is thus a doubly dark spot: not just as a commemorative place for the ten dead men, but also a place to mourn the shamefully reflexive reaction by the "international community" – to run away and leave Rwanda in the lurch. What there is to see: The complex, which used to be part of an army base, is accessed through a gate, with an old barrier boom now permanently swung 90 degrees out of the way. Beyond is a cluster of single-storey buildings and to the right a small memorial garden. 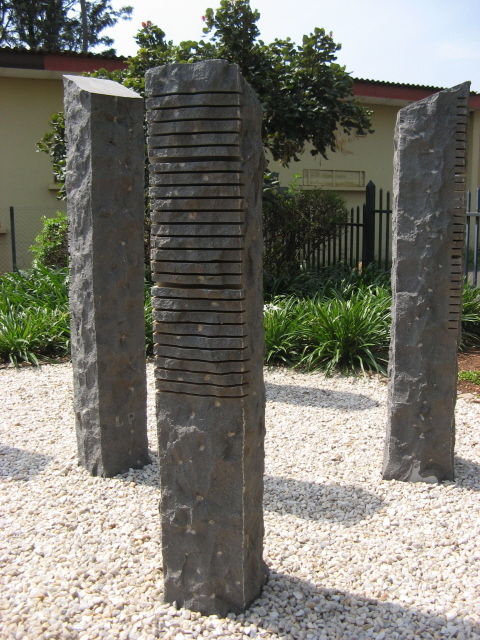 This is the centre point of the actual memorial and features ten dark grey granite columns, one for each of the soldiers killed. A number of notches on the side indicates how old the respective soldiers were at the time of their death ... most were in their twenties. 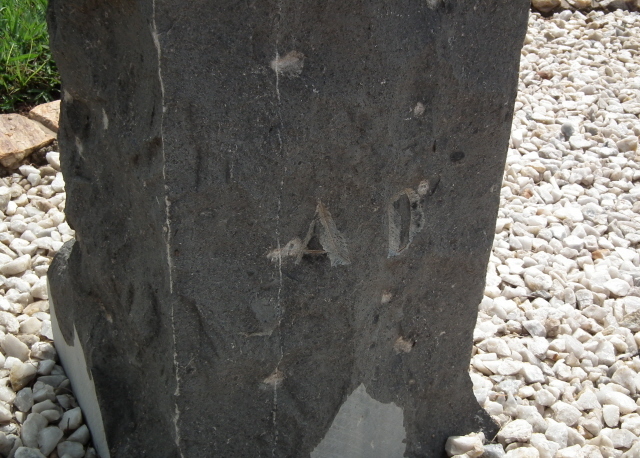 Their initials are chiselled at the bottom, so you can match them against the memorial plaques on a nearby wall that lists their full names. 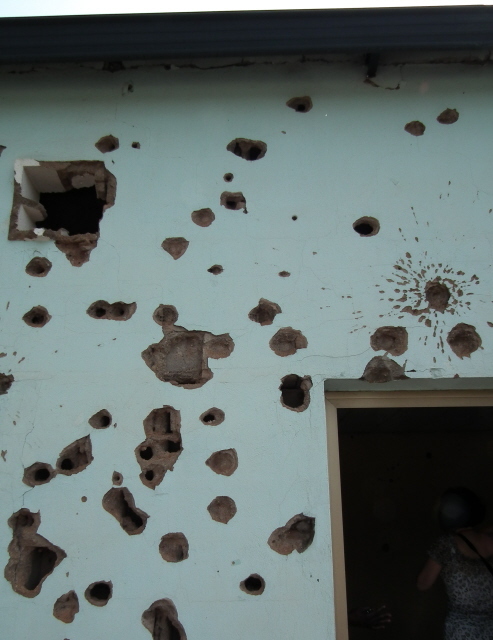 The rest of the wall of the same building is the starkest element of the site: it is pockmarked with shell and bullet holes. Inside, there's another plaque with names, flanked by a Belgian and a Rwandan flag, next to a corner of the room where more shell/bullet scars on the wall and patches of a darker coloration indicate the place where some of the soldiers met their deaths. 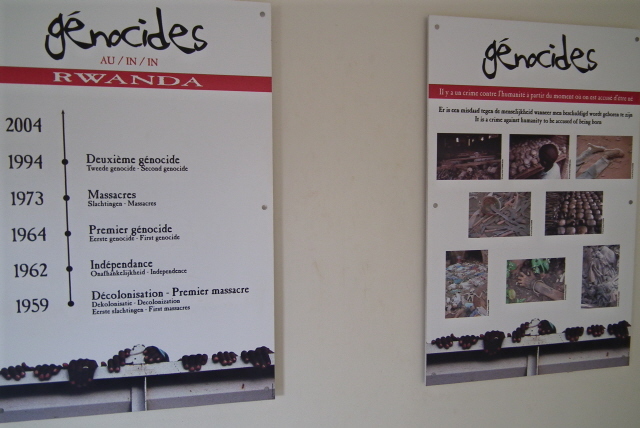 There are two more rooms accessible, and a number of trilingual (French, Dutch, English) panels have been set up, giving a rough overview of various genocides world history has seen (though not all of the episodes listed here are universally classed as actual genocide), as well as some basic information. On one wall there is a blackboard area, now under glass, on which scribbles and drawings hurl taunting abuse at the UN and UNAMIR's then commander General Romeo Dallaire, under whose command these casualties occurred. These expressions of disapproval with the otherwise widely accepted view of Dallaire as a courageous "hero" are quite a stunning thing to behold. The site was set up and is maintained by the Belgian government. Could it be that it too still feels it has axes to grind? Even though Dallaire was officially cleared of all accusations of neglect or misconduct. Some kind of explanatory text accompaniment would have been in place here. As it is, the visitor is left puzzling for themselves over this blackboard element of the memorial. Overall, small-scale as it may be, it is still an important site – both regarding the historical significance and in terms of its rawness and rough edges. A place of only a few deaths – in contrast to the often overwhelmingly amassed human remains in some of the other genocide-related memorial sites in Rwanda – but still leaving quite an impact. One of the must-see sites for the dark tourist in Kigali. Location: just south of the centre of Kigali, about a mile from the large roundabout at the northern entrance to the city centre, three quarters of a mile from the Hotel des Mille Collines, and only steps from the Serena Hotel (formerly Diplomates, the InterContinental), at the end of Avenue de l'Armee, where it curves 90 degrees to intersect with Boulevard de la Revolution. Access and costs: quite easy, free. Details: given the central location it's quite easy to get to the site – if you are staying within the city centre you could even walk it, otherwise it's a short taxi/scooter ride. I visited the place as part of a guided tour with a driver/guide; and when we got there, everything was freely accessible at no extra cost. There was nobody else about, no guard, no local guide, no one to charge any money or open or lock any doors. I can't say what the opening times of the indoor parts of the site may be (I presume they will be locked overnight), but it can be assumed that any normal working day during normal business hours should be fine. Time required: between 10 and 20 minutes should do for most visitors. Combinations with other dark destinations: obviously, the Kigali Genocide Memorial Centre in Gisozi is a must – the main such site in Rwanda, and also one that tries to strike a more even balance and place events in a wider context. See under Kigali for more secondary dark sites within the city limits. Combinations with non-dark destinations: the site is near the centre of Kigali, so look under that city's entry for more general info.